One of my goals when I began in the Blythe hobby was to eventually have at least one Blythe of each mold type. It’s just one of the things that I always liked about looking at photos of Blythes – dolls next to one another and me trying to see if I could see the difference between the molds. At this point, I’m pretty good about recognizing the different molds in photos. It takes a lot of time getting them dressed though. At this point, I have 9 and they spend a lot of time in the same clothes (heh). It’s not their fault, of course, it’s just that dressing and figuring out what clothes each doll should wear takes a lot of time. But I love them. A lot. Even if they’re always demanding new shoes and clothes, something that I’m not trying to give into this year. 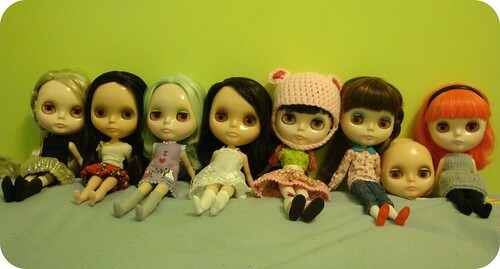 All my Blythes, except for the newest addition – Mollie (short for Molybdenum), Simply Sparkly Spark. I have one of every mold except for ADG (which I’m currently not interested in) and BL. I’m currently thinking of a Mondrian or a Parco – but the idea of plunking the amount of money down for a Parco would probably put me into an anxiety fit (yet buying a Kenner was somehow okay?). I know that some people don’t like the SBL mold, but you have to admit that a lot of the SBLs came with fantastic stock clothes. My only SBL is Velvet Minuet, who was one of the first Blythes that I had seen (online). I have a maximum amount of 10 that I want to maintain, so seeing as I have 9 Blythes right now, that only really means room for one more (a BL – but I have decided to give myself a loophole that Blythes after the tenth one will be okay provided that they are Kenners). 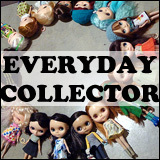 Are there other people who have one of each type of Blythe mold, or are working towards having one of each Blythe mold? SBL’s are my favorite! I am always lusting after the girls with this face mold to add to my (growing) dolly collection. Lots of people ooh and aah over the newest mold..Fairest..but I don’t really like it all that much. I just love the sophisticated and oh so slightly mischievous look of a Superior girl. I’m still very new to Blythes so I still can’t tell the differences yet but I am sure I eventually will. I really do think I need to set some sort of limit because I can totally see this getting out of hand quickly. 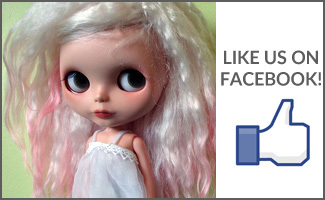 It has only been about a month since I received my first Blythe and I am already up to 5. Wow, 5 in one month! That’s impressive! It was an entire month before I bought my second Blythe 😉 You’re well on your way to having one of all of them! Some of the later BLs didn’t have fully boggled eyes, so that could be an option (some that come to mind are Aztec Arrival, Sunday Best and Dottie Dot). I have two RBLs, one stock, one slight custom, two ADGs, both customs, an EBL, and two BLs. I am focused on a third BL, because quite frankly, they have become my favorites! Mondie is amazing, Michelle. I had to have my blonde, and if I ever do get a Kenner, it will be a blonde. I may pick up an FBL down the line. I’m not too interested in other RBLs…I used to be, but there is something that makes me want to save for a Kozy instead. Mondie is definitely more attainable than a Parco! I’d probably have nightmares of dropping Parco on a sidewalk or something if I ever got one, heh. I love your photos of your Mondie, she’s adorable. 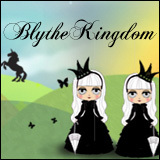 When I discovered Blythe in August, I quickly set myself the goal of 2 of each mold! I really don’t know why I thought two rather than one, but I’ve achieved it already, apart from ADG, who I’m in two minds about. I have Mondie V3 & Goldie (BL), Rouge Noir & Fruit Punch (EBL), V Smash & Pow Wow Poncho Inspired (SBL), Prima Dolly Paris, Vinter Arden & Simply Sparkly Spark (FBL), and … um … let’s just say several RBLs! I have to confess to being a bit of a compulsive collector! I’d love to have a Kozy join my BL girls, but think I might start saving for the always-desirable Kenner! I love all of the molds, but probably SBL is my least fave. I selected the two I have with a great deal of deliberation and adore those individual girls, as they have to-die-for hair.